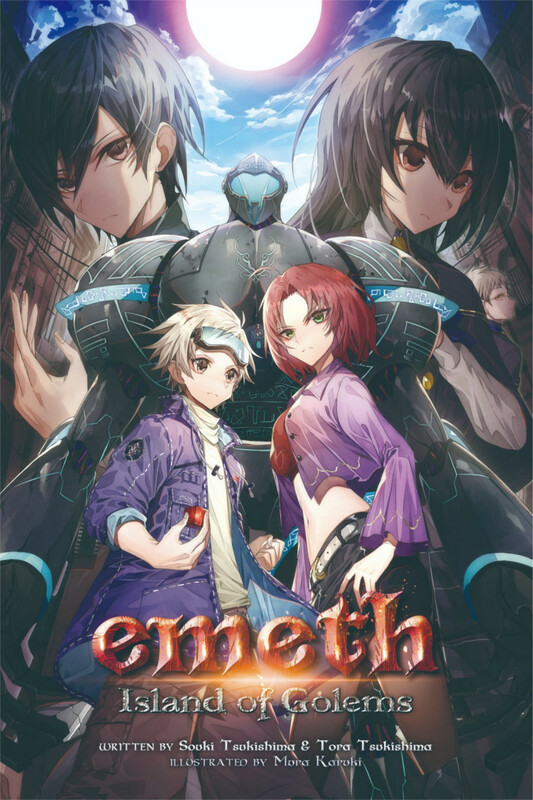 Cross Infinite World has announced a license for the single-volume light novel emeth: Island of Golems (titled emeth～人形遣いの島～ in Japanese, AKA emeth ~Ningyōtsukai no Shima~). This was published in Japan by Square Enix Novels in March 2007, and was written by Souki Tsukishima and Tora Tsukishima. The original cover art was by Koutaro, but the upcoming English release will be illustrated by Mora Karuki. You can find the novel’s Japanese webpage here. Synopsis: “Creating Life”—such power is blasphemy against God. In emeth’s world, the manufacturing of Golems—automatic dolls that move according to human will—has become the norm. This sets the stage for an epic adventure against the backdrop of St. Rollins Archipelago, where the Torah Church presides over all creation and operation of these Golems. Step into the story through the perspective of Cliff, a boy living in the slums of a Torah-controlled island who so fervently wants to become a Golem Tamer that he has begun to illegally build one. His mundane world is suddenly shattered one day when he crosses paths with a mysterious girl. This meeting sets the gears in motion for a thrilling journey involving powerful Golems, corruption, and the very fate of the island itself! Souki and Tora Tsukishima are known for writing novels for Final Fantasy: Type-0. A video game of the same name was released for the PSP in Japan in 2011, and later as a remake for other consoles worldwide in 2015. You can find lots of lovely artwork by Mora Karuki on the illustrator’s website. It sounds like emeth: Island of Golems is planned to release digitally in English on November 5, 2018. It also sounds like a physical release may be planned for a later date. Update: You can now preorder the ebook on Amazon. Oh, physical releases by CIW :D I’m very excited for this one, but I may wait for the physical edition in that case.